The tridimensional art of Artur Lescher has raised the bar of sculpture in his present exhibition. 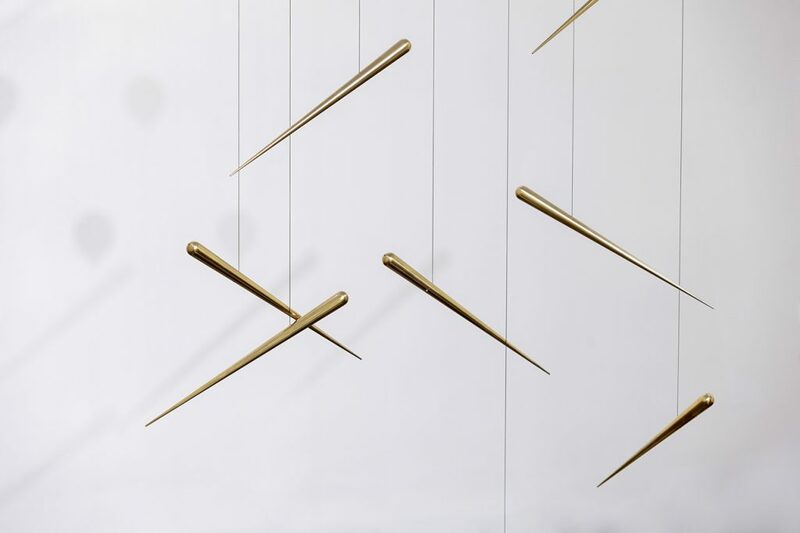 The series explores a cosmos composed of a personal golden constellation of fourteen floating—apparently weightless—beautiful pieces, most of which use gravity as a principal tool. 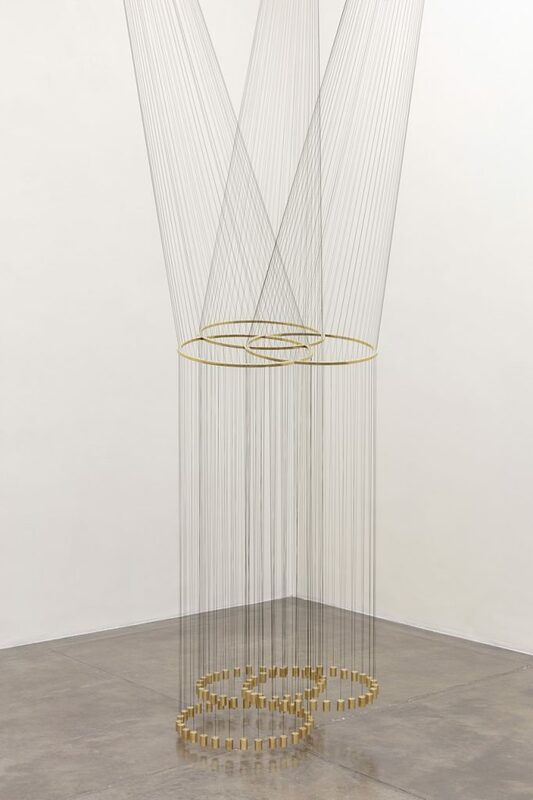 In jewel-like polished brass, stringed with the musical elegance of an imaginary harpsichord, “Asterismos” (Asterisms)—an astronomical expression for groups of stars seen from our planet’s night sky—is his well-sharpened fifth solo exhibition at Galeria Nara Roesler. 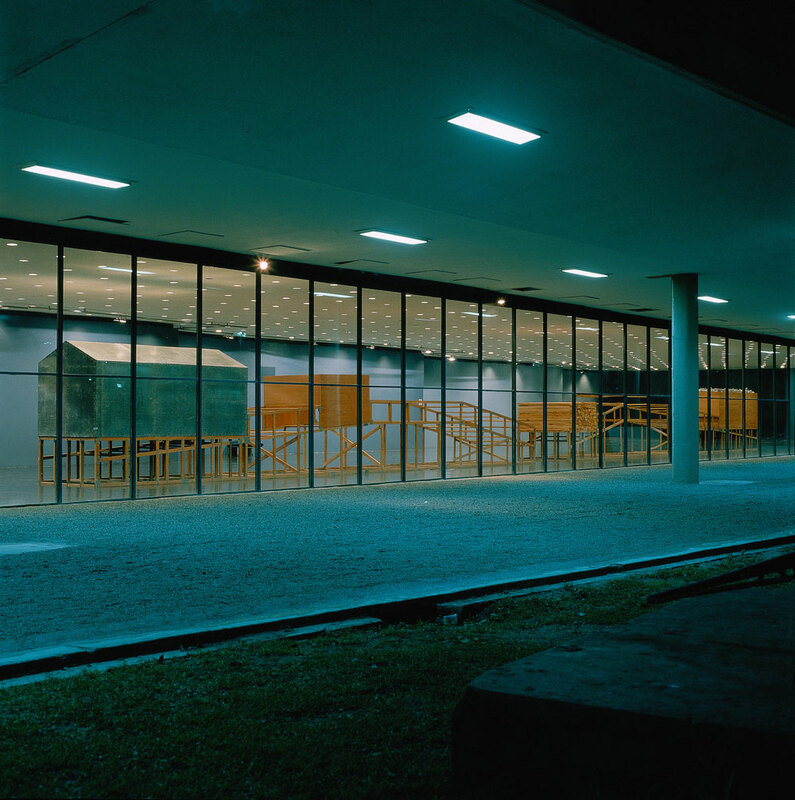 Dual installation in interior and exterior of the Bienal Pavilion by Artur Lescher, Aérolito, 1987. 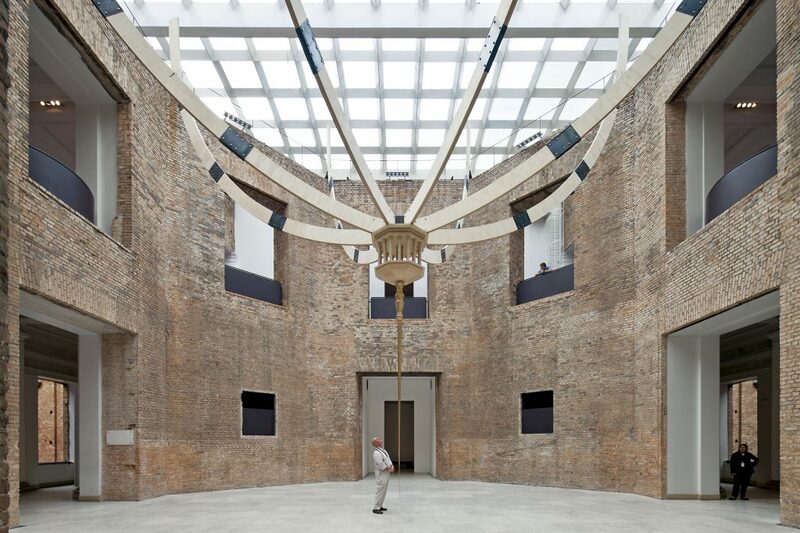 In 2017, the artist displayed his tridimensionality in the solo exhibition “Porticus” at the Palais d’Iena in Paris as part of FIAC. 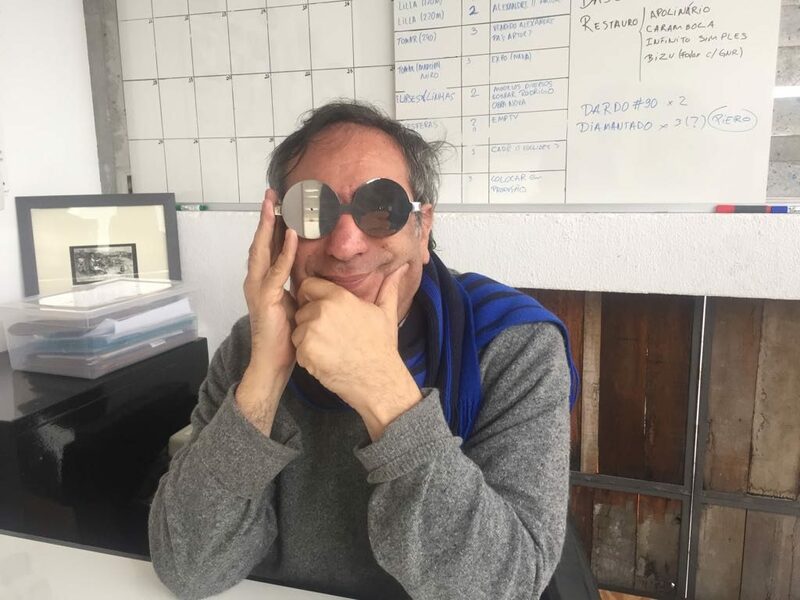 It certainly was a long way from 1987, when barely twenty-three years old, he boldly submitted his first work to the São Paulo Bienal, “Aerólitos,” just for the fun of it. For his surprise, it was accepted. The two shiny silver Zeppelin-like structures, each measuring eleven meters long, toyed with reflection and our childhood “Little Prince” imagination. 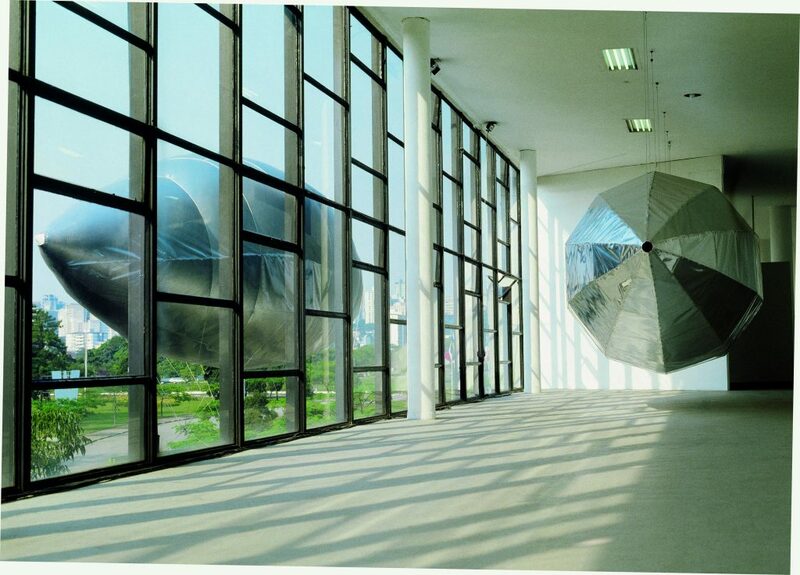 Both blimps floated in parallel alongside the paneled glass windows, one inside the pavilion, the other, inflated with helium, hovered on the exterior of the building over the park. From then on, Lescher’s fluid dynamics took off. This is an artist that not only knows his geometry but also has an excellent command of space. Almost two decades later he landed his concern for the urban environment some meters away from the Bienal Pavilion at the Museum of Modern Art (MAM/SP). “Se Movente” is a thirty-meter-long wood and zinc longitudinal system structured with stilt houses crisscrossed by boardwalks alluding to the floodplains bordering the seasonal tributaries of the Amazon where entire bustling villages float. To get a whole view of the grand installation that literally took up all the interior of this single-floor, single-room museum with a glass façade throughout its extension, you had to stand on the lawn at a forty-meter distance. Laundry, liquid desconstruction (Desconstrução Líquida), instalação, 2014, Made by Brazilians, Hospital Matarazzo, São Paulo, Made by feito por brasileiros exhibition. Photo by Leonardo Finotti. 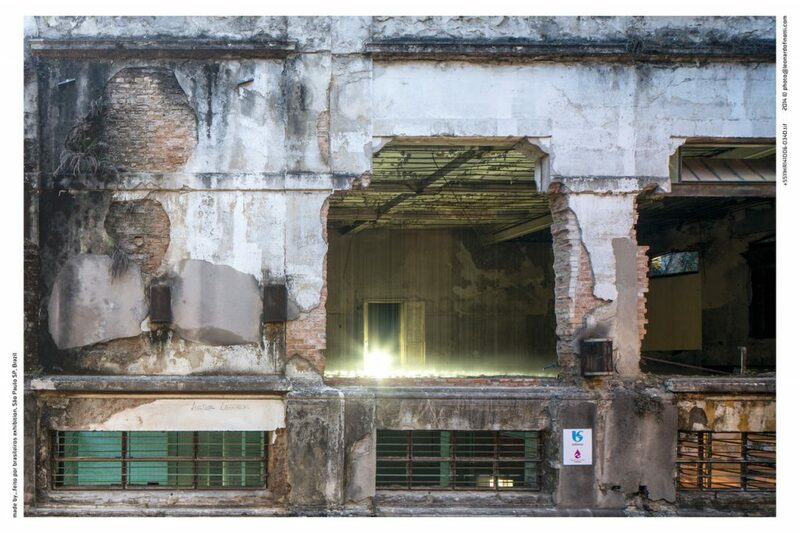 In 2014, at the collective exhibition “Made by…Feito por Brasileiros,” a three-month creative invasion of contemporary art and music with more than a hundred Brazilian and international cutting-edge artists at the crumbling Matarazzo Hospital at Paulista Avenue, the São Paulo-born artist occupied the old laundry rooms. His in-situ installation provided both visual and sound experiences in a five-hundred-square-meter area with but a single element: water. By pumping reused H2O, a non-stop rainfall showered from the decaying ceiling of the top room—with hardly any floor left—and dripped at the lower space. Not only did it suggest a cleansing but also the tears shed in a place like this haunted with memories of sufferance and joy. “Laundry, Liquid Deconstruction” poetically purged the decadent estate built in the eve of the twentieth century in the style of an Italian villa as São Paulo’s first public hospital. Above all the insight was a commentary on the metropolis’ never-ending layers overlapping people’s lives, good or bad, horizontally and vertically. Fifty-six-year-old Artur Lescher participated in two editions of the São Paulo Bienal, as well as the 5th Bienal do Mercosul, at Porto Alegre. His work has been shown in Latin America, Europe and the US. 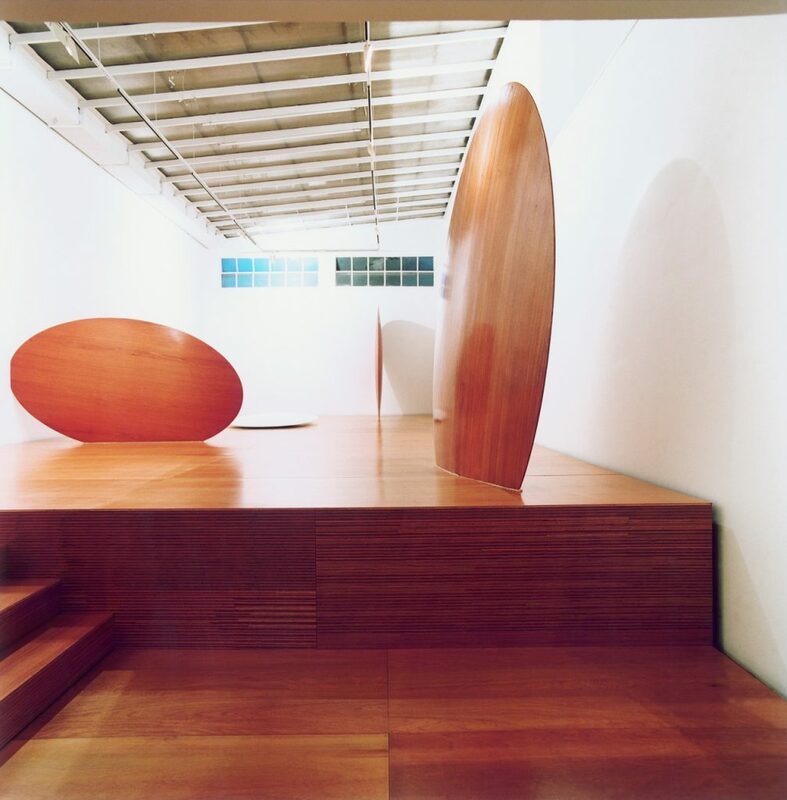 In 2006, the artist was granted the Special Award at the Kajima Sculpture Competition in Tokyo. Artur, have the cosmos and the invisible laws of physics always attracted your interest? When I was a kid, on the wall facing my homework table, there was a map of the solar system. I am sure that must have influenced me in some way. My schoolteachers were always picking on me, saying I had my head in the clouds. Your work toys in the void between architecture and design. How do you see it yourself? Architecture, as I see it, is above all a mental space. My work sheds light on aspects of a project that have been forgotten with the pragmatic use of space. At times I think of my work as simply making visible what is already present. Another issue is transforming known space and use it in a way to the point we feel we are seeing it for the first time. What was your main challenge now in this fifth exhibition in the same space, in the same gallery? In every exhibition all my effort has been focused in building something new for the same space. Asterisms is the possibility of a new constellation, it is an exercise on assembling points and from them creating figures. Asterisms are non-official constellations, that is quite an important aspect because it gives each one of us the power to draw with our eyes our own personal constellations. This is what the works on show do. They are built with lines and metals that intertwine and create connections and fields of attractions suggesting images and agglomerates. There is an interrelation and a communication among all the pieces that also includes the exhibition space, which represents in itself another body in this system. We can imagine and experiment the possible connections by simply following the lines or the projections designed by each piece. In this sense, once can say it is an exhibition based on the drawing, rather spatial drawing. Another aspect of your oeuvre are the industrial materials and rigorous industrial processes required to build your works. I consider materials like characters in a play, they have there own voice. My part is to listen to their voices because the materials are necessary to write the “dialogues” of the piece. 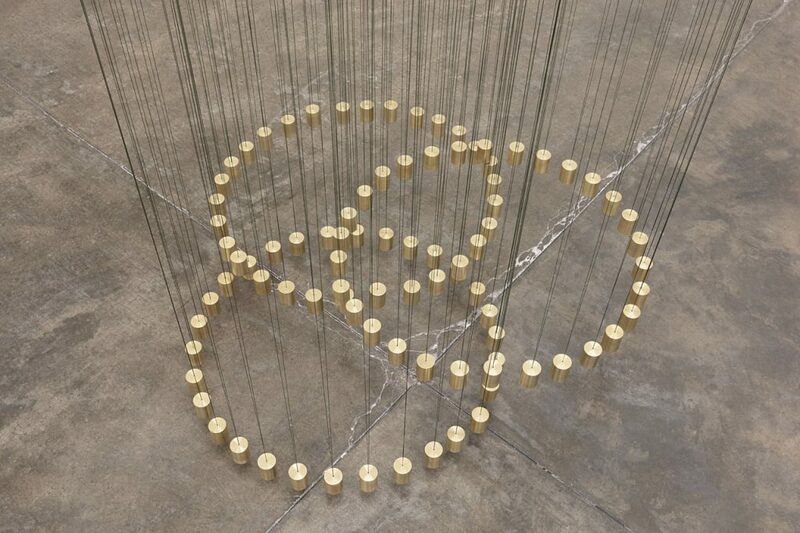 The concept of a work is built around the relationship of the materials. It is an in-depth discussion of relations that goes on. I act as a theater director trying to change the dialogues of these “characters” by emphasizing on certain issues and by conveying a dramatic atmosphere through sharp, accurate lines while the gold bronze puts it weight aside and answers to the desires of the lines. I begin by sketching over and over again in my notepad. Once I feel the idea is finally well-rounded, the next step is to make a detailed project and execute it. For the building process of the pieces the drawings are translated into technical jargon to go through the industrial machinery and then to a final laborious process of polishing and finishing. My work resembles that of an architect, to plan, draw, and sometimes I build a small-scale model. The execution requires specific tools and a knowhow I do not master. I work in partnership with workshops that understand my ideas and I enjoy the overall engineering involved: the building strategy of the pieces and searching for structural solutions. There is something musical in this exhibition. True, there is something musical. I have played some instruments for my own pleasure; surely that must have some influence. The idea of an orchestra pleases me with the sound created by a group of instrumental voices and its spatial occupation. 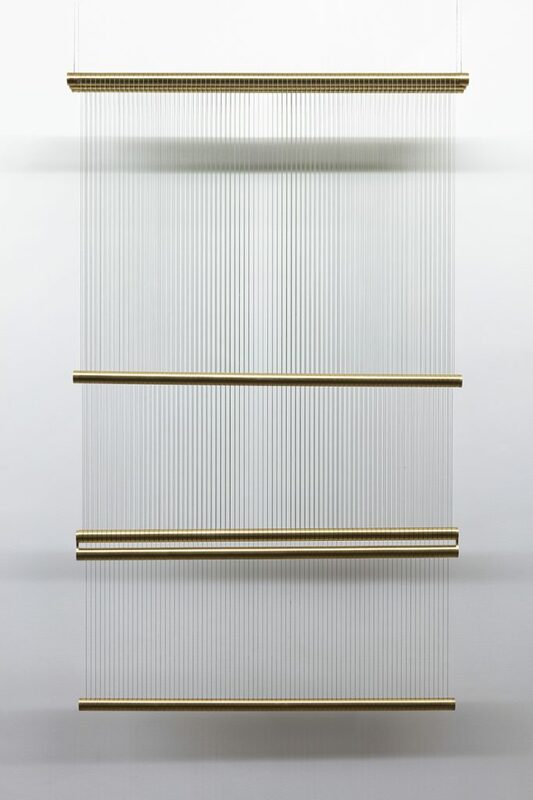 When suspended, my works vibrate, this confers on them the status of musical instruments. No doubt music is present in the math of the pieces. I consider myself a sculptor but it is an anachronistic category—I am rather an artist who dialogues with the tradition of constructive art, both concrete and neo-concrete. 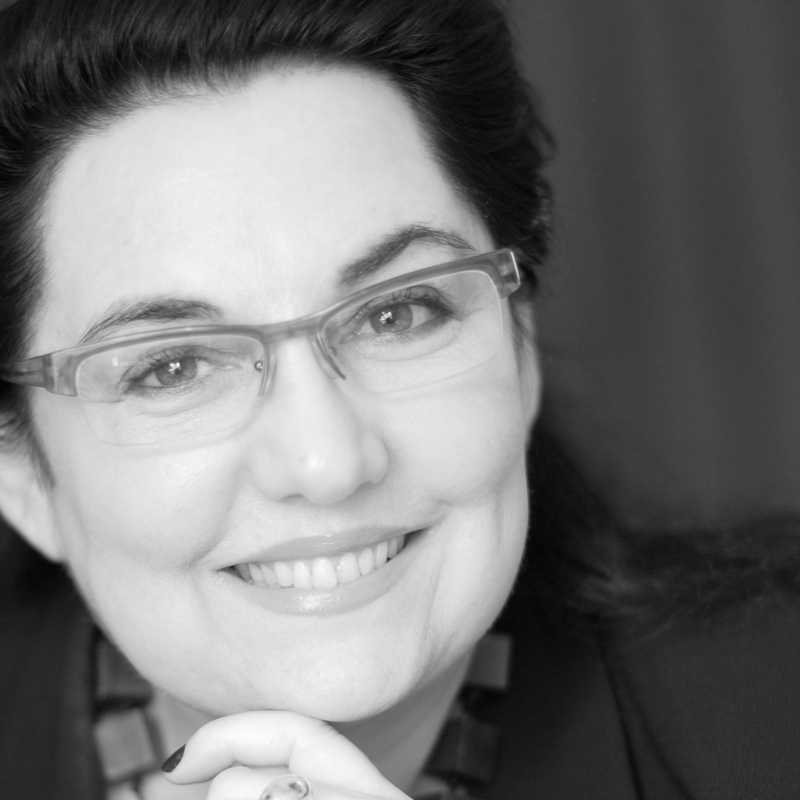 I value ingenious work since ideas prefers to inhabit materials that have been worked through, it is clear to see in the poets and writers I admire. This is crucial to build your own poetics. Have you always wanted to be a visual artist? On the contrary I was scared by the idea—most artists lived a tragic life. The Russian poets committed suicide or were exiled in Siberia or died having no recognition. On the other hand, all the attempts I made in other professions failed so, in truth, I had no choice. What are the main cycles your path has gone through? My first São Paulo Bienal was a major challenge, to impress the jury I submitted “Aérolito” (1987), a complex work I was unsure how to realize and it was chosen. When the jury demanded to see the project, I, twenty-three years old, had to give it all to prove to them it was possible. It served as my artistic baptism. 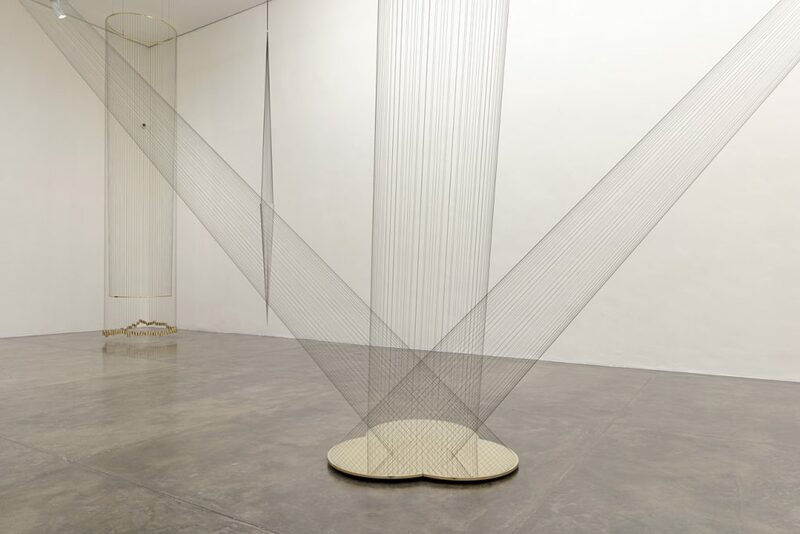 After that several exhibitions followed: “Elípticas” at Galeria Nara Roesler in 2002; the site-specific installation “Inabsência,” at Pinacoteca, in 2003; “Laundry, Liquid Deconstruction” at the Matarazzo Hospital in 2014, and in 2017 the show at Palais d’Iena, in Paris. What artists have influenced your insight? My teacher was Carlos Fajardo: with him I learned that art is a form of language and I understood a work of art is built based upon a specific grammar. This is my foundation stone. After that I picked up other issues through other interlocutors, such as to how to create a poetics, and how to connect the work with different contexts and with the issues related to the urban environment and life itself. Another stepping stone in my learning was artist Milton Machado; with him I discussed almost everything. With over three decades dedicated to art, what do you have to say to the new generation of young, struggling artists? It is no easy choice. it involves compromise with oneself as well as to a long line of great artists before you, some achieved recognition in their lifetime, others remained unknown. My advice is to seek good learning, not necessarily academic, and remember literature is crucial, just as important as theory. Look for a good group of interlocutors, dead or alive, doesn’t matter, and be prepared for the worst: in the end it will work out!